Over in the Thaxted Thread discussion has begun for the Holiday Project. Pierre has suggested We Wish You a Merry Christmas. He has suggested a deadline of Dec. 1, 2014. I thought to post another thread in case anyone was not reading over at the Thaxted thread. I am in, if we can settle on the song to use. what you play is what I will play. I'm in...whatever the song! I'm glad you started this thread, Toni. I have to admit that I hadn't been keeping up on the Thaxted thread until I saw that you mentioned my name. I have an opinion on the deadline vs. no deadline discussion, but I'll post that over there, except to say I think that it's a given that a Christmas project requires a deadline. I see that Pierre added the holiday smileys, per your request. Thanks, Pierre! We wish you a Merry Christmas sounds good what Key by chance??? For the "official" Fiddlerman video projects, Pierre will post the sheet music for the different levels to play and the exact tempo, (click track) and all the goodies. So in the next weeks we will get all the info on the requirements. It is a blast.. Looking forward to playing with you. I hope everyone joins in this year for a great end of the year Holiday Project. wow...looks like we have a good start with 8 people already jumping in. Well you might find someone sneaking about who normally doesn't do much. Obviously it would be much more dynamic with an even...... nine. It seems talking of Christmas music and the slump seemed to work. I personally love this time of year. I save 2/3 of my vacation days every year for Nov/Dec. Every Friday off from Nov 7th until Jan 9th and 2 extra days thrown in for good measure. I started writing the music today. Was thinking 4 parts but maybe not. We'll soon see. Still haven't decided the key for sure, but am starting in F. I can quickly change that in Finale. I'm now thinking Key of D, perhaps optional one octave higher on the repeat. We Wish You A Merry Christmas Rough Draft. 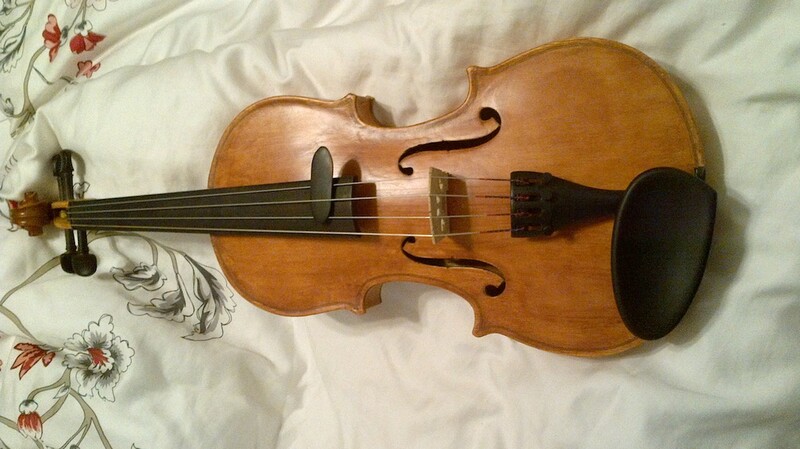 Maybe I could "Pick" it on my little blonde viola like a fretless mandola. I'm in for this project. Love the idea of the optional one octave higher for the repeat - good opportunity to work on higher positions. Pierre, here is a slight change to 2 bars of We wish you song. 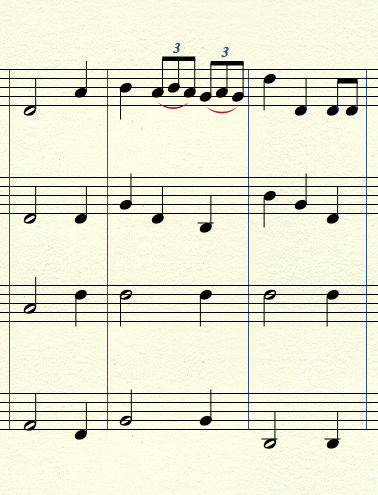 This change is taken from a notepad of Christmas music done in fiddler notation my father had. I transcribed it to yours here. The rest is exactly as you posted. Is it possible to have this change? Thanks for the suggestion. Personally I like the A pickup which is in my head but a D would work as well. The rhythmical change that you propose doesn't really matter much, we can do that same sort of rhythm in several places and possibly triplets or 16th notes as well. We can do it in the accompaniment too if we want to complicate things but I have found that we leave some people out when I complicate the sheetmusic.